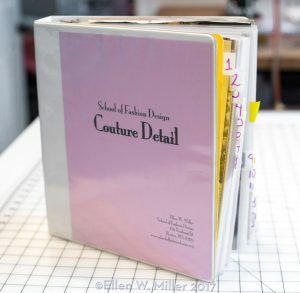 I was inspired to write Creating Couture Embellishments while teaching a Couture Details course at the School of Fashion Design in Boston, Massachusetts. Throughout the class I was frustrated by the lack of a comprehensive text that my students and I could use as a resource. 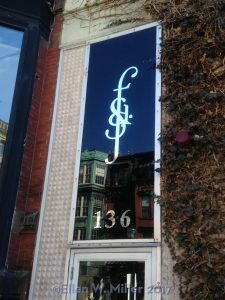 Each technique required me to copy magazine articles or chapters from out-of-print books. Some articles included only hand-drawn examples while others had no drawings at all, which in this era of YouTube/Instagram how-to graphics, can make understanding a concept much more difficult. Additionally, each article author wrote in their own voice, using different terminology and assuming varying amounts of knowledge. I decided to create this missing resource myself by amassing all of the information into one volume, written in one voice and including numerous illustrations and consistent terminology. 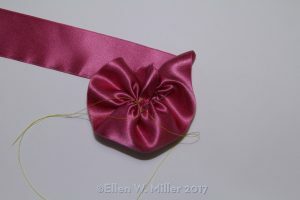 A sewist can now pick and choose which techniques to use from the wide selection of choices found in this one book. When I signed the contract with Laurence King Publishing of London in 2009, we thought it would take me two years to “write” the book. Seven years later the book is finally going to be published in August, 2017. Why, you might ask, did it take that long? By way of example, the first chapter to be written was Flowers; I made the samples and took the photographs for that chapter four times. Discarded photo: The grid behind the flower was confusing. 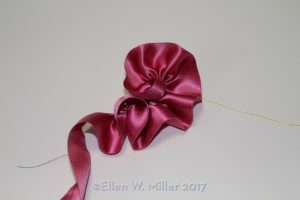 Discarded photo: The flower was too flat. 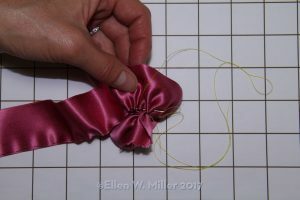 Final version of photo for Step 8 in Peonies: The flower is perky and both threads are visible; the green gathering thread is to the left and the yellow sewing thread is to the right. Multiply this process by 174 techniques (plus a few that didn’t make it into the book), and the years flew by. 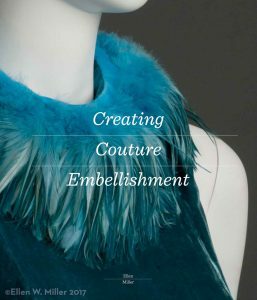 I couldn’t be more pleased with the results; every time I look at Creating Couture Embellishments I am amazed by the beauty and breadth of the book. To sum up and date myself: it’s wicked cool!